This is a 4 TB hard drive formatted in Mac's Disk Utility as a single non bootable Exfat partition with the drive letter G. It worked fine before I decided to make a clone drive of my C bootable drive. During boot Windows repaired the new clone drive with the letter E, after that G is no longer accessible in Mavericks or Windows. The hard drive is listed in Mac's Disk Utility and Windows Disk Management. But there's no drive letter and I'm unable to mount it. In Windows Disk Management, the Hard Drive shows as Healthy "EFI System Partition" labeled as Free Space. All the options are grayed. Only "Convert to Dynamic Disk..." is accessible. Error: This disk doesn’t contain an EFI system partition. If you want to start up your computer with this disk or include it in a RAID set, back up your data and partition this disk. As mentioned, this is a non bootable drive. The documents in the drive are very important, so a format would be detrimental. I suspect Windows` chkdsk or another Microsoft tool to erroneously repairing the partition table of your device containing the EXFAT volume. The differences to your finding are obvious: the first partition of your disk isn't aligned properly to the 4096 byte sector size and is smaller. 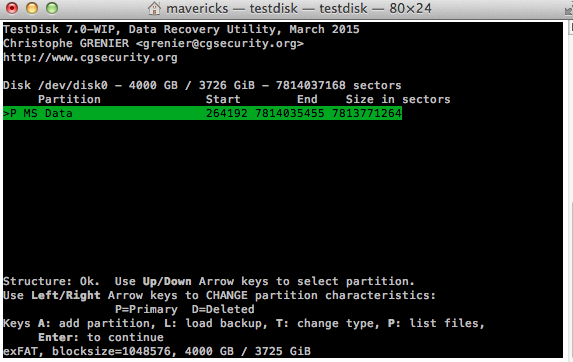 The second partition starts too early and is probably too big. 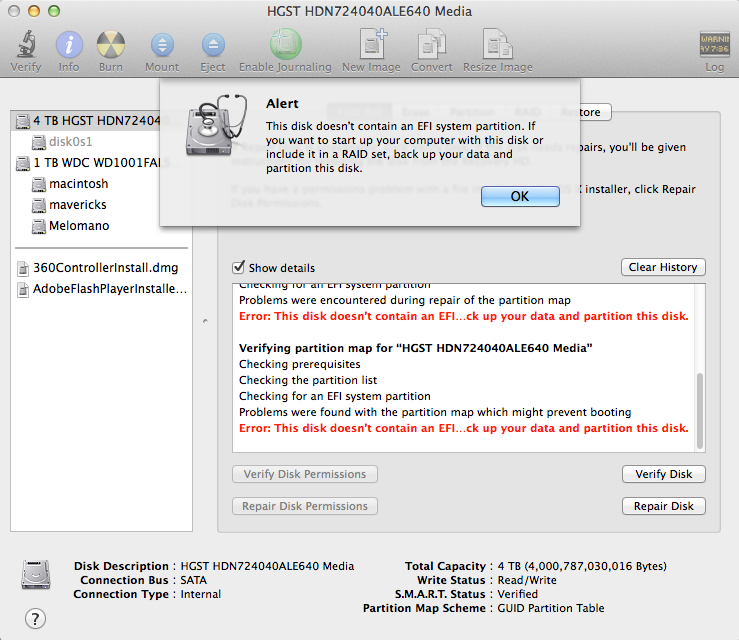 You probably have to fix both partition. 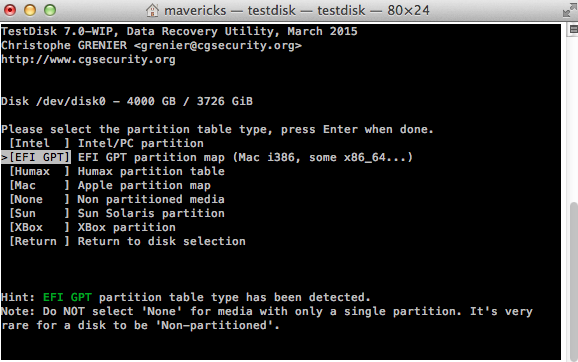 This will only work if you partitioned the drive with Disk Utility in Mac OS X. Backup your Mac and then detach all external drives. Download and install wxHexEditor. Enable the root user and log-in as root. Hint: While working with wxHexEditor don't use copy and paste. Enter everything manually! You might accidentally write directly to your disk. Where does the EXFAT partition start and end? Open Terminal and enter diskutil list. Get the Identifier of the disk to repair. Open Calculator. Open wxHexEditor. Check that you work in read-only mode ("Options" -> "File mode" -> "Read only"). In the menubar go to "Devices" -> "Open disk device" -> choose the appropriate diskNumber. 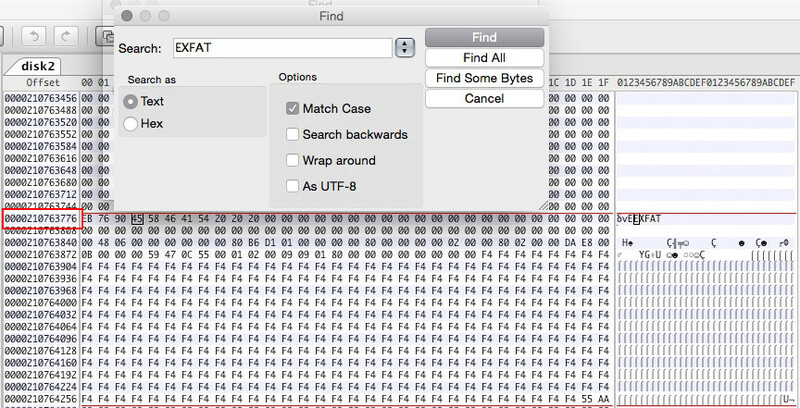 Hit the search button (marked with the red circle in the picture below) and enter EXFAT (exactly like in the picture). Please try to arrange the wxHexEditor window like in the examples below with straight red lines. My EXFAT entry (see picture below) is at offset 210763776. Now you can calculate the start block of the volume with: OffsetBytes/512 = NewStartBlockEXFAT. The start block in my example is 411648. If you get a significantly smaller starting block (=<409639) stop here, because you probably didn't partition your disk with Disk Utility previously. The ending block of the EXFAT volume can't be determined easily; we have to guess it (somehow). The problem is the variable gap between partition 2 and the second GPT table. In your case it has 1679 blocks, in my example it has 2015 blocks. The maximal volume size is StartBlock2ndGPT-NewStartBlockEXFAT. The size has to be dividable through 8. Reduce the size until you get a size dividable through 8. Example: In my case the maximal size would be 7813779423 (StartBlock2ndGPT) - 411648 (StartBlockEXFAT) = 7813367775 (which isn't dividable through 8). The biggest size dividable through 8 is 7813367768. 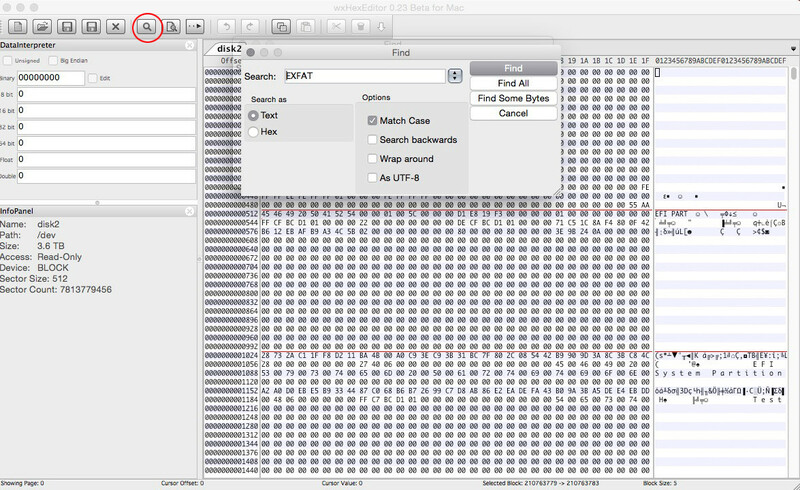 You might jump to sector 7814037135 (the first block of your secondary GPT table) with the arrow button (the second button left of the search button) and search backwards and match case disabled with "Find some bytes" to get the last occupied sector. This may take a while. Make a note of your finding (if you have one in a reasonable timeframe). Divide the offset through 512 to get the sector number. The sector number should be smaller than 7814037135. Now calculate the provisional minimal size of your volume: StartBlockEXFAT+1-LastOccupiedSector. The result must be dividable through 8. To get size add blocks until the size is dividable through 8. You may stop the process after 5 minutes without result because then the last occupied block number is probably smaller than 7807917625 assuming the process searches 10 MByte/s (the last ~3 GB of your disk). Use Method 1 then. Both results probably lead to a wrong size of the EXFAT volume, but this should be repairable. It's more important to get the proper start block. Additionally method 2 may deliver incorrect results if the disk has been completely filled with data previously using a different partition layout and hasn't been zero-filled afterwards. Here i assume the identifier of the disk containing the EXFAT volume is disk0. Quit Terminal, Calculator and wxHexEdit and open Disk Utility. Check your EXFAT volume for errors. If you run into problems (e.g you can't find the proper EXFAT volume size), have doubts or questions immediately stop and contact me with a comment @klanomath! Not the answer you're looking for? 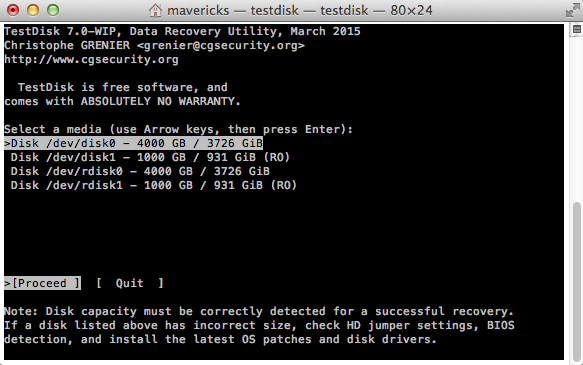 Browse other questions tagged mavericks hard-drive disk-utility partition sata .